A Non-Surgical Rhinoplasty (Nose Job) involves using Injectable Fillers to improve the appearance of your nose. In our practice, our expertise is with Silikon-1000®, an off-label filler for permanent results. The choice of filler depends on the preference, and experience of your surgeon. We have been using Silikon-1000® for Non-Surgical Rhinoplasty and Non-Surgical Revision Rhinoplasty for over 17 years with wonderful success, and hundreds of happy patients. Non-Surgical Rhinoplasty procedures may help camouflage a small dorsal hump- a bump that is visible on your profile. Filling above and below the bump may improve your profile so your nose appears straight and less distracting. 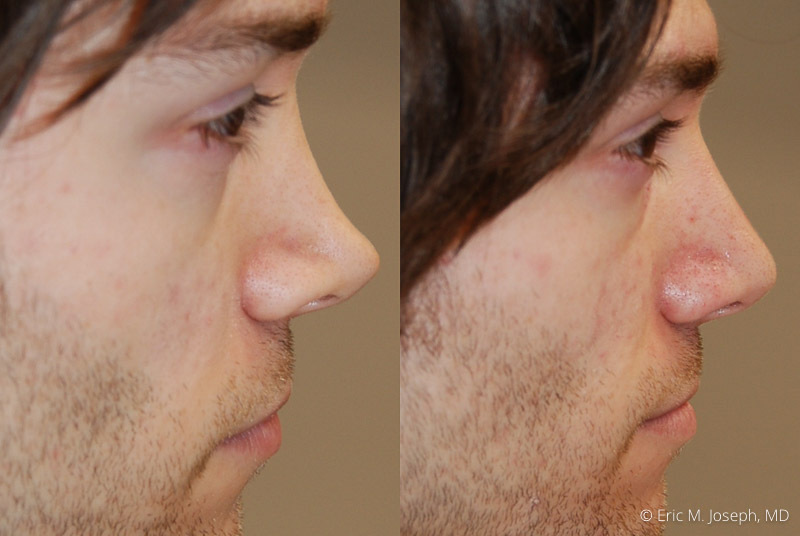 If your nose has a profile-hump that is too large, then a Surgical Rhinoplasty may be the best way to proceed. A crooked nasal appearance can also be corrected with this approach. A concavity on your front view may cause your nose to appear twisted. Filling the concave area can lead to a straighter, more pleasing appearance. Visible imperfections after a previous Nose Job may be dramatically improved with a Non-Surgical Revision Rhinoplasty. Minimizing the appearance of Rhinoplasty-related irregularities, without additional surgery and downtime, is often a welcome alternative for our patients who are suitable candidates. Post-Rhinoplasty irregularities in your bridge, tip, and nostrils are often dramatically improved during an office visit. If asymmetric tip cartilage becomes bothersome after Rhinoplasty, it may often be camouflaged with Silikon-1000®. A pinched tip can be widened, and high, retracted nostrils may be lowered - all while avoiding Revision Rhinoplasty Surgery which may be inconvenient, costly, and often unnecessary. Non-Surgical Rhinoplasty and Non-Surgical Revision Rhinoplasty treatments are performed with minimal discomfort using topical anesthetic. There is typically no downtime, and normal activities are resumed immediately after the procedure. If you’re an appropriate candidate for Silikon-1000®, results are completely natural and permanent. When considering a Non-Surgical Rhinoplasty procedure, the experience of your physician is critical. The injections must be carefully placed at the correct depth. We almost exclusively use Silikon-1000®for Non-Surgical Rhinoplasty procedures, and several treatments are typically necessary to achieve complete correction of most conditions. Patient satisfaction is very high. You may need Rhinoplasty Surgery if your airway and septum require correction. You may also require Rhinoplasty Surgery to make your large nose smaller or if significant tip modifications are necessary to produce a pleasing result. If you are looking for improvement in the appearance and function of your nose, please Contact Us today for a Cosmetic Consultation so we can see what is best for you.